Depron USA, Dynamics Unlimited, Aerocomposite Design, RC Specialties, and others. Still, the sheets are small, expensive, and only available through mail order. French R/C enthusiasts can get boxes of 10 huge sheets (120x80cm) for a few Euros at their local hardware store. July 2002: Many European modelers build parkflyers and slowflyer out of a wonderful material called Depron. Depron is sold in some European countries as an insulation material. 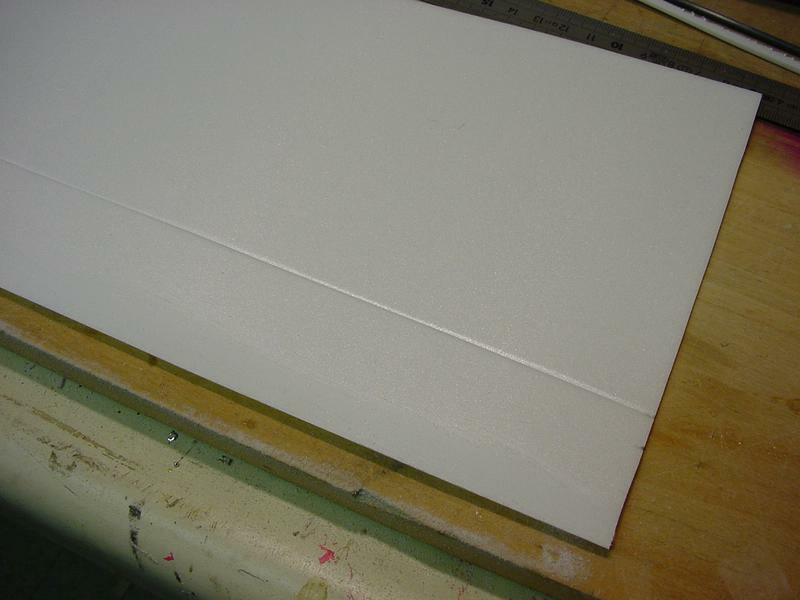 It is very inexpensive and comes in large sheets (80x120cm) and two thicknesses: 3mm and 6mm. Many American modelers have been looking for a similar miracle material available on the west side of the pond. One possible substitute (if you don't need large sizes) is those styrofoam cafeteria trays. A better alternative is a foam that I called Zepron, which is available from Air Dynamics. Gabe Baltaian from Air Dynamics was kind enough to send me some Zepron samples so I could try my Depron constructions techniques with it. Zepron comes in 2mm and 3mm thickness. Unlike Depron, Zepron does not seem to be strongly anisotropic, i.e. there is no predominant orientation of the fibers that causes a greater stiffness in one direction. Zepron is less stiff than Depron, but is quite a bit easier to put into shape. Zepron can be flexed with a much smaller radius of curvature than Depron. 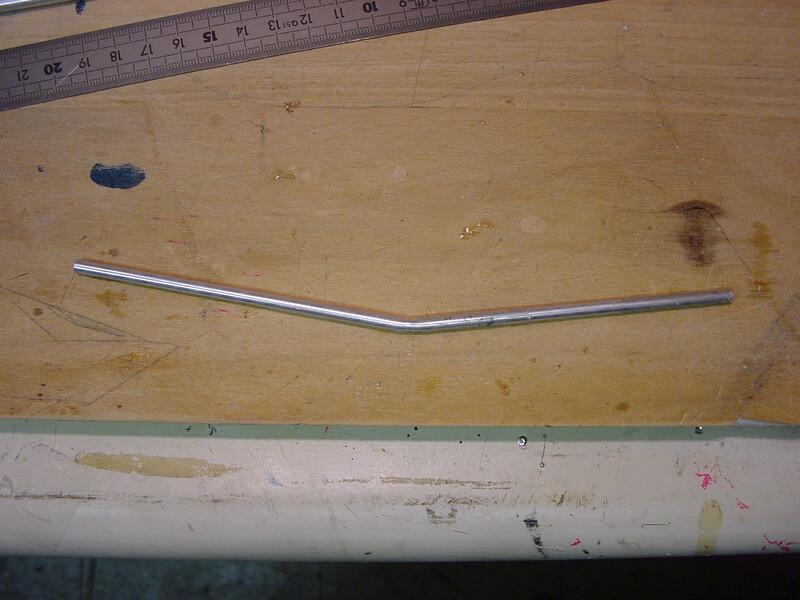 This property makes it useful for building wings of fuses by folding or rolling a sheet of Zepron. In addition, preliminary experiments seem to reveal that heating Zepron with a heat gun seems to increase its stiffness. Some French modelers say that shaping Depron can be done by plunging it in boiling water. I haven't tried that myself, but I suspect this would work with Zepron as well. Zepron can be glued with epoxy, odorless cyanoacrylate (the normal CA melts polystyrene), and various other non-solvent based glues and cements. 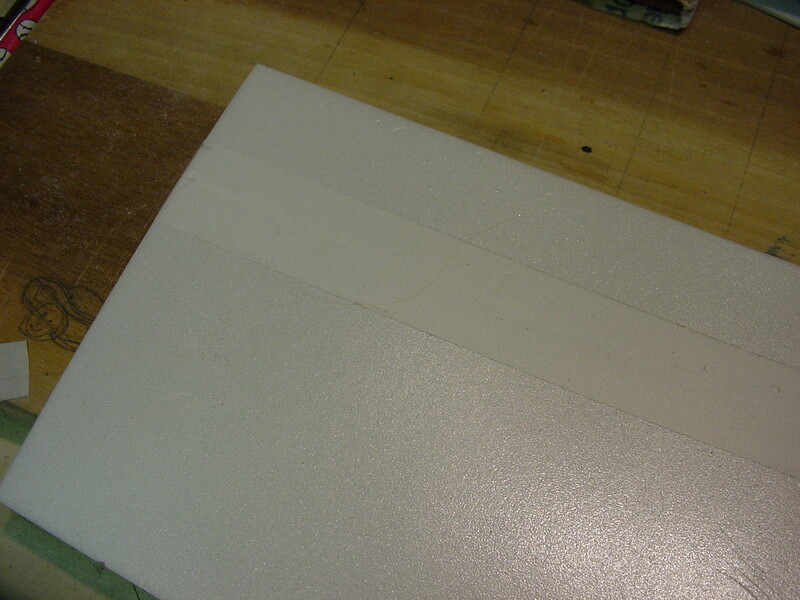 Many impatient builders will dispense with glue altogether and use double-sided tape or Blenderm tape. Blenderm is a really cool adhesive tape made by 3M for the health care industry. It can be found in some pharmacy or ordered online. If you feel like buying the stuff in boxes of 16 rolls, you can order from medical supply stores (like MVAP Medical Supplies), but if you want more reasonable quantities, you can order from Air Dynamics. Zepron has an advantage over Depron: it can be bent with a radius of curvature without breaking (if you are careful). This allows to build small wings by folding a single sheet over itself. You can also do that with Depron, but it's a little trickier than with Zepron. 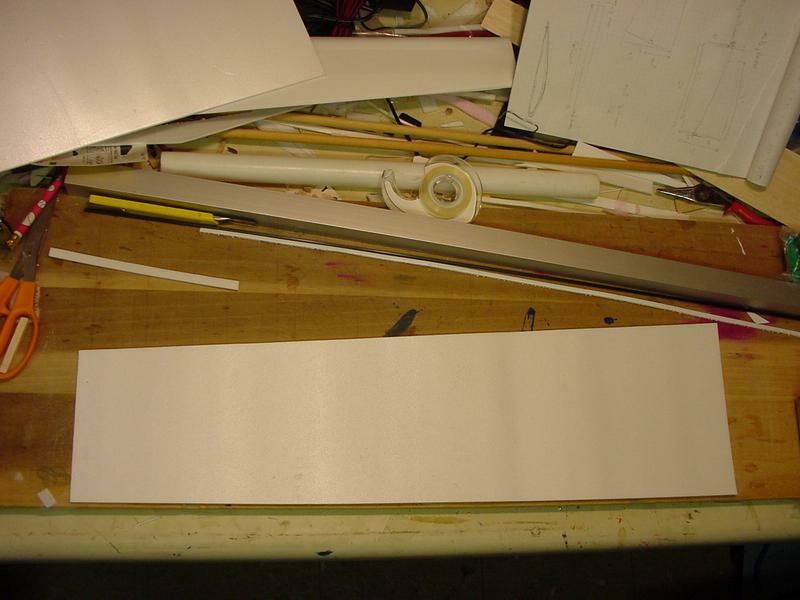 Here is how to build a high aspect ratio slowflyer wing. No ribs, no spars, no slow glue, no balsa. Cut a nice piece of Zepron. Make it rectangular for a non-tapered wing, or trapezoidal for a tapered wing. 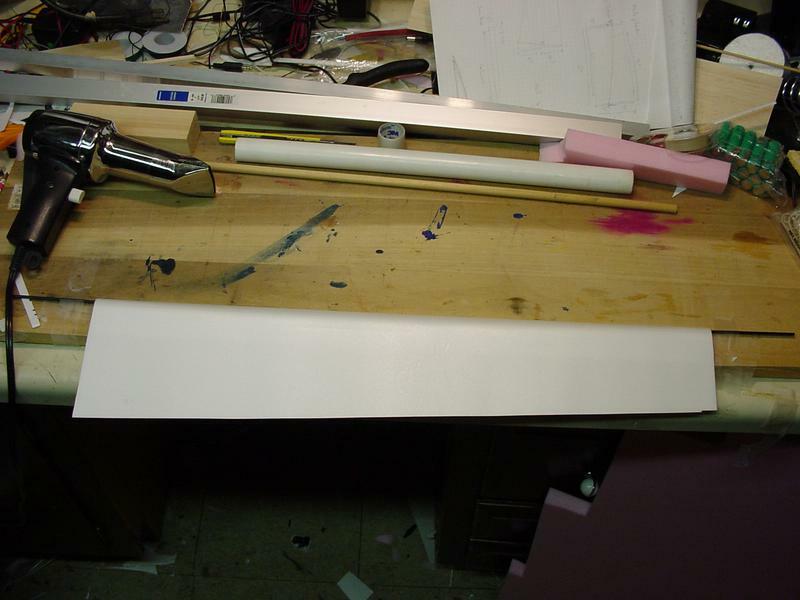 Stick a piece of blenderm tape lengthwise where the leading edge will be (the tape will be on the external side of the fold that we are about to do). 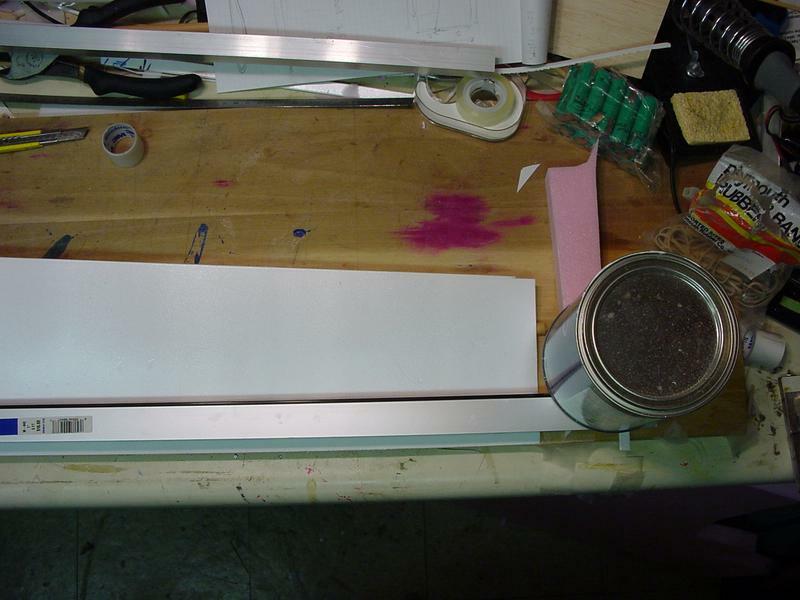 Flip the sheet (blenderm facing the table) and press the corner of a square tube (aluminum square on the picture) on the sheet so as to make a groove right where the internal side of the leading edge fold will be. This will make it easier to fold the Zepron. 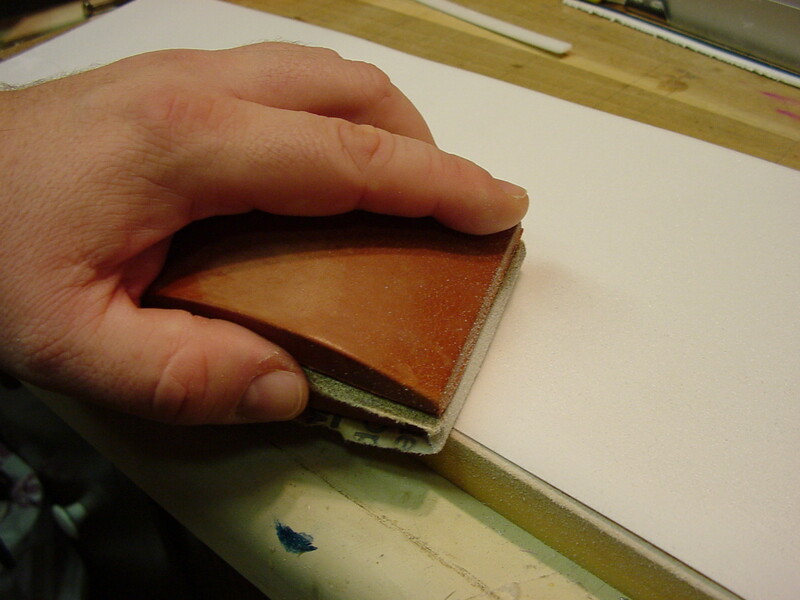 Make sure the groove is lines up with the middle of the blenderm, but on the other side of the sheet. 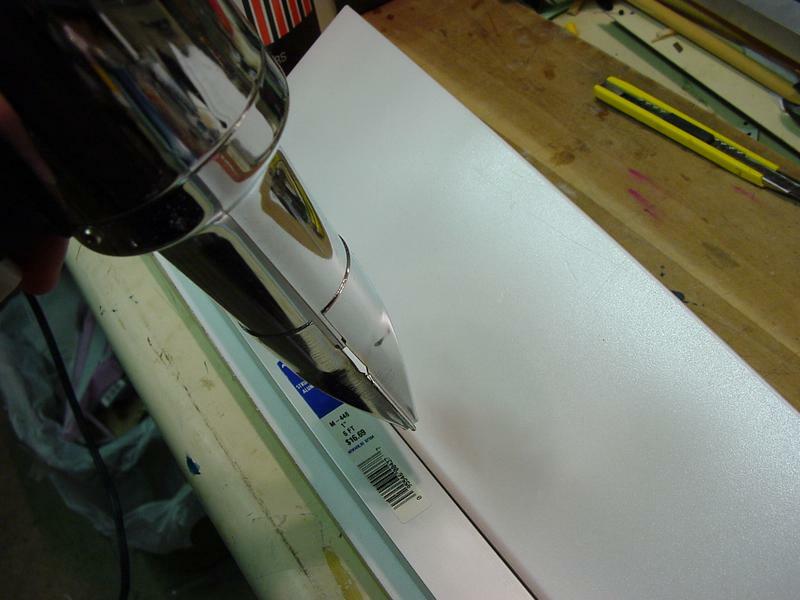 Line up the edge of the sheet (the one that is closer to the leading edge groove) with the edge of the table. Sand the edge into a wedge. This wedge will be the surface that we will stick to the underside when we fold the wing. Put the aluminum square on the sheet right behind the rod and hold it in place with weights. This will hold the sheet in place while we fold. 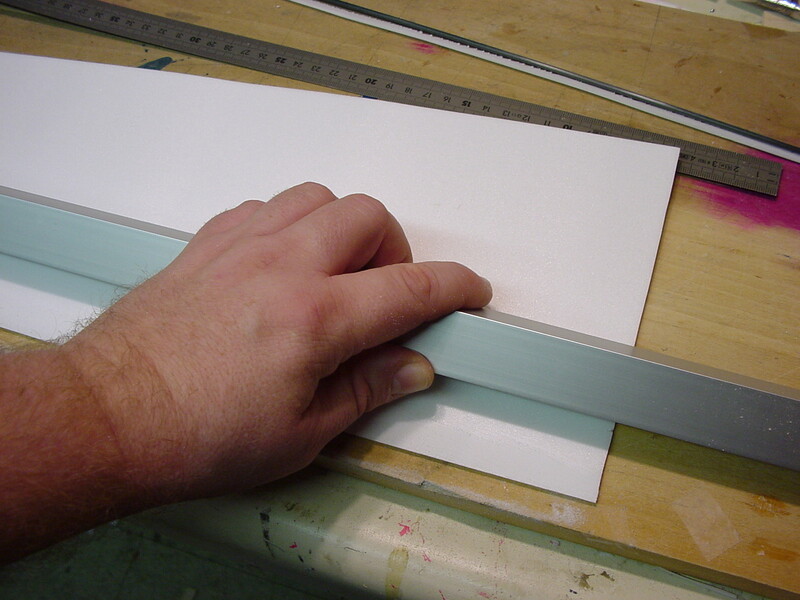 Heat the fold with a heat gun while folding up the sheet in front of the rod. Use another aluminum square (or any kind of rod) to press on the zepron while folding. 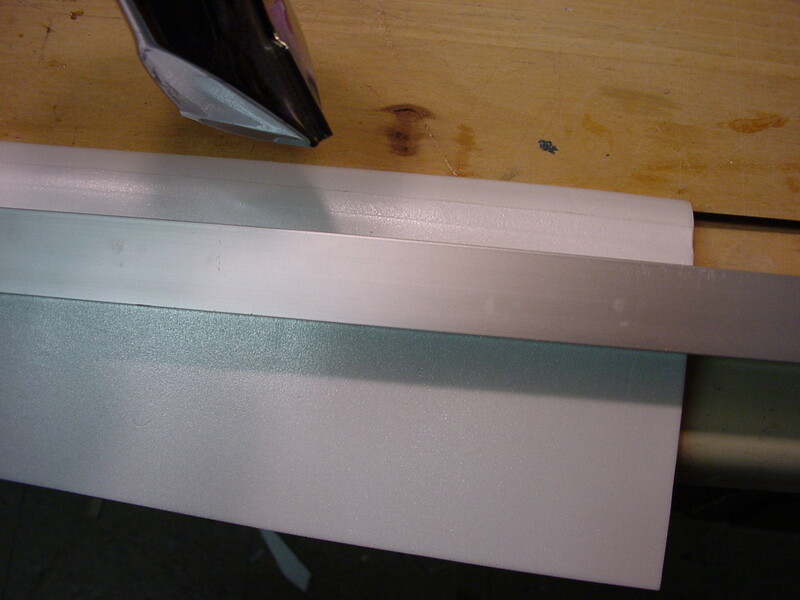 Remove the aluminum square that holds the sheet in place and use it to completely fold the sheet while heating with the heat gun. Apply odorless CA glue to the sanded wedge and press the top side onto the wedge with the aluminum square (caution: use odorless CA, the regular CA melts the foam). Your half wing is ready. No spar, no ribs, no slow-setting glue, no balsa, no sweat. Look at this nice Jedelsky-style airfoil. 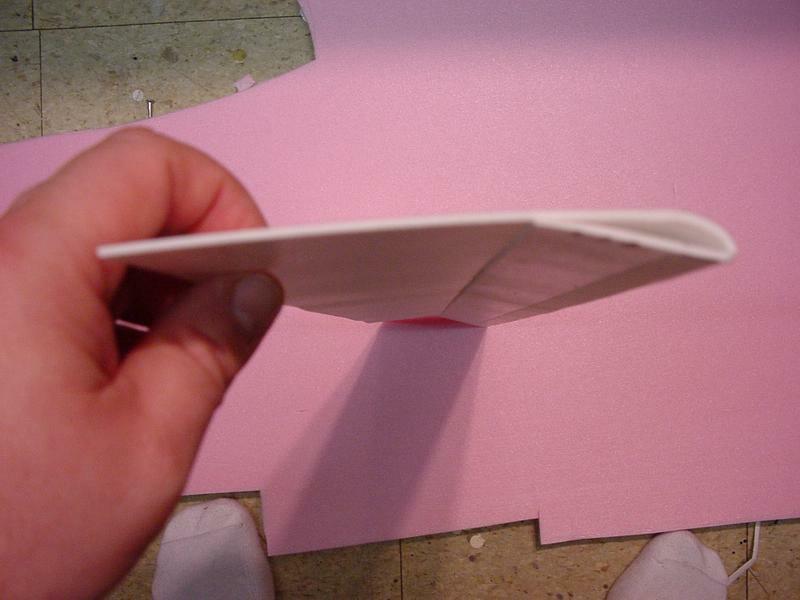 Unlike a non-folded sheet, a folded sheet is rigid and will not warp (at least not too much). 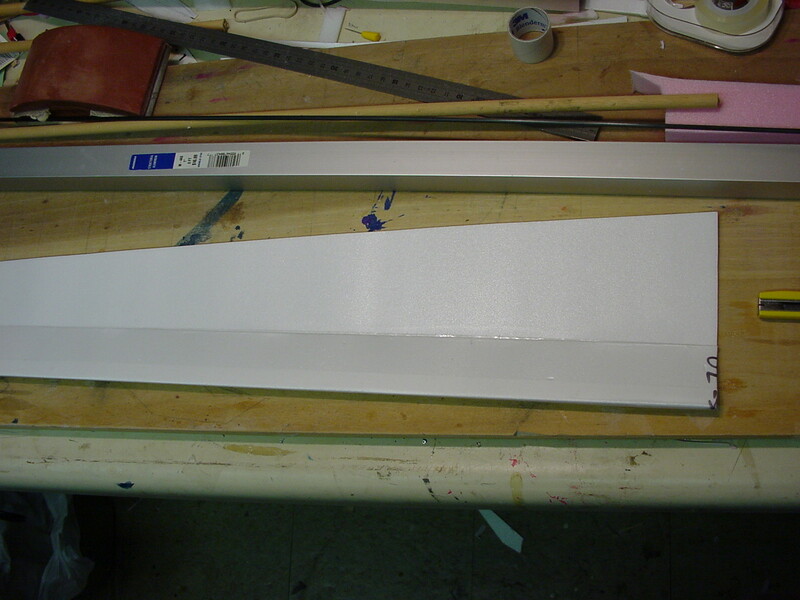 The two half wings can be assembled with a small brace made of an aluminum tube. 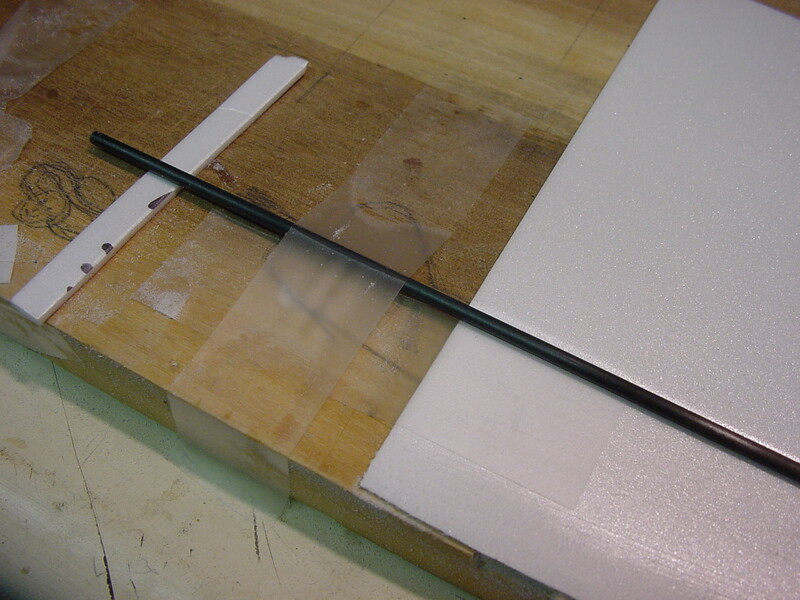 If you are in a hurry, the tube can be taped inside the wing with double-sided tape.